photo © Flame Engineering Inc.
As part of an organic weed control program, the Weed Dragon is an effective tool for reducing or eliminating the use of chemicals. Propane is considered an eco-friendly fuel and using heat to control weeds rather than chemicals is a relief to all involved. It may not solve all of your weed problems but can be used as part of a larger organic or conventional weed control program. Propane torch kit comes full assembled with a 10 ft. hose (cylinder sold separately). Ideal organic solution to controlling weeds in the yard, concrete cracks, rock gardens, fence lines and curbs. 100 000 BTU torch takes only a few seconds to control weeds. Can also be used as a torch to start charcoal, thaw pipes, melt snow and ice, and many other construction applications. "Fully assembled and ready to go, the Flame Engineering 100,000 BTU Weed Dragon garden torch kit helps eliminate the risk of chemical residue and run-off, making your lawn and garden safe for your family and pets. Designed for homeowners or landscapers who don't need the power of a farm torch, this handy tool helps keep your lawn and garden weed free and reduces the need for mowing or chemical use in hard-to-reach places. In fact, the 23-inch handle length and 10-foot gas hose make it a snap to reach every corner of your yard or garden so you can aim precisely and get optimum coverage exactly where you need it. 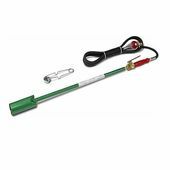 CSA International Certified and easy to operate, the Weed Dragon connects to a standard propane cylinder and has a two-inch bell." In an effort to reduce my pesticide usage at work and research organic weed control options for the future, I purchased the Weed Dragon Torch Kit by Red Dragon. Flame weeding is becoming a more desirable option for weed control because of its use of eco-friendly propane and the reduced or eliminated usage of dangerous chemicals. I purchased the model with the squeeze valve in the handle for full flame thrower effect. I also bought the cylinder dolly which makes moving the tank around easier. Most of the weeds I torch don't last too long but I have had to repeatedly torch some stubborn ones. I use the Weed Dragon on weedy, stone filled islands in a parking lot, and on some curbs and cracks. It took some time to figure out how to flame the weeds long enough without starting fires. One problem I encountered was that it was very easy to burn anything that was on the ground whether it was twigs, maple seeds or anything else that could catch flame. This is an issue for me because flame weeding attracts enough attention without having the ground smoking and smoldering around me. Overall, the Weed Dragon is a great weapon to add to your arsenal of organic weed control methods. It won't solve all your weed problems but it is great at what it does and has multiple year-round uses.